Finalists will be honored Tuesday, September 27 at The Yale Club in NYC. The finalists for Cynopsis Kids’ fifth annual !magination Awards have been announced. The event will highlight the most outstanding cross-platform programming and marketing - and the executives behind the scenes - in the highly competitive and dynamic kids media industry. The complete list of finalists can be found here. They include: 7ate9 Entertainment, Cartoon Network, Disney, DreamWorksTV, Food Network, FOX, Hasbro, Litton Entertainment, National Geographic, Netflix, Nickelodeon, PBS KIDS, Saban Brands, Sesame Workshop, Steve Rotfeld Productions, The Jim Henson Company, WNET, YouTube and more. 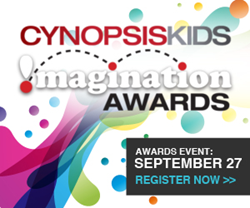 The Cynopsis Kids !magination Award finalists will be recognized at a breakfast ceremony and mimosa networking reception on Tuesday, September 27, from 8:15-10:30 a.m., at The Yale Club in New York City. For registration questions, contact Sarah Martinez at sarah(at)cynopsis(dot)com. For advertising, sponsorship information, or to buy an ad in the program, contact VP of Sales & Marketing Mike Farina at mike(at)cynopsis(dot)com.